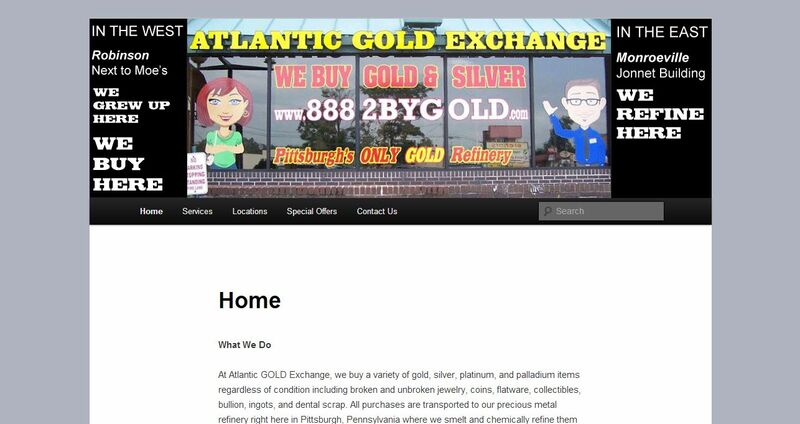 Atlantic Gold Exchange address, phone, website, hours of operation, and more. At Atlantic Gold Exchange, we buy a variety of gold, silver, platinum, and palladium items regardless of condition including broken and unbroken jewelry, coins, flatware, collectibles, bullion, ingots, and dental scrap. All purchases are transported to our precious metal refinery right here in Pittsburgh, Pennsylvania where we smelt and chemically refine them into pure precious metal. We don’t outsource any step of the refining process nor do we ship your precious metals to another state or overseas to be refined. We buy it here, we refine it here, and the money generated by your precious metal materials is invested right back into our community. We are not a reseller which means our prices are based strictly on the precious metal content your items contain. We’ll give you an honest appraisal and accurate estimate of your materials and write you a check on-the-spot, but you’re never obligated to accept our offer. In fact, we encourage you to shop around at other local gold, silver, jewelry, and coin buyers before visiting us here at Atlantic. We’re confident that once you come to us, you won’t waste your valuable time or sell your valuable items anywhere else. We run an honest business in compliance with local laws, hold all items in their unaltered state for 5 days, and report all purchases to local police. Our stores are open Monday through Thursday from 9:00 am to 6:00 pm and Friday and Saturday from 9:00 am to 5:00 pm. We also offer Sunday appointments and private parties.